Trim and finely dice fat and tail of Bacon and render. Keep the trimmings which should be very crispy. Fry the lardons of Bacon in the rendered fat. Fry Black Pudding in the rendered fat. Keep aside. Peel shape and par-boil the potatoes. Brown them in the rendered fat. Place Potatoes on the bottom of the plate. Top with the Black Pudding. Top with Salad Leaves and crispy Bacon bits, dress and top with the warm poached Egg. Spoon the Red Wine Sauce around. Prep Chicken. Remove and keep the skin. Season the skin with Flour, Seasoning and Ras el Hanout. Fry with a pan on top, turning frequently until very crispy. De-bone the Chicken and portion. Mix with Flour, Ras el Hanout and Breadcrumbs. Leave to marinade. Prepare Rice and Peas. Roast Peppers and Garlic. Blend with tinned Tomatoes, Ketchup, Worcester Sauce, Stock, Seasoning and Olive Oil. Bring to a slow simmer in a pan. 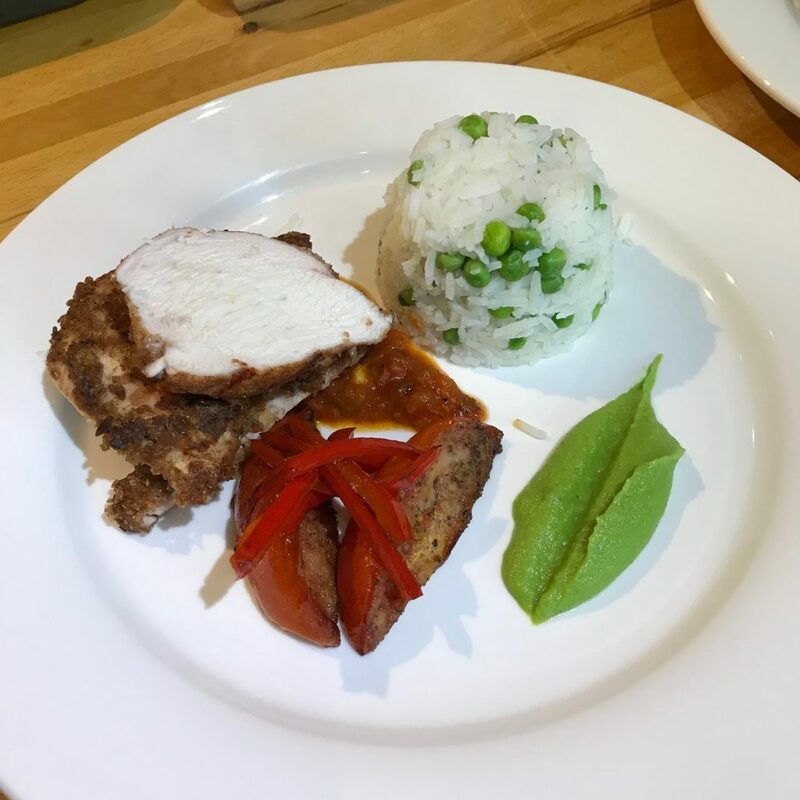 Served the Chicken with the Rice and Peas, Pea Puree, charred Black Pepper Tomatoes and julienne of stir-fried Red Pepper with Balsamic. I used Brioche instead of sponge to line the bottom of the mould. Butter the mould and pour in the Cream Cheese mixture. Bake slowly until set. Leave to cool and remove from the moulds. 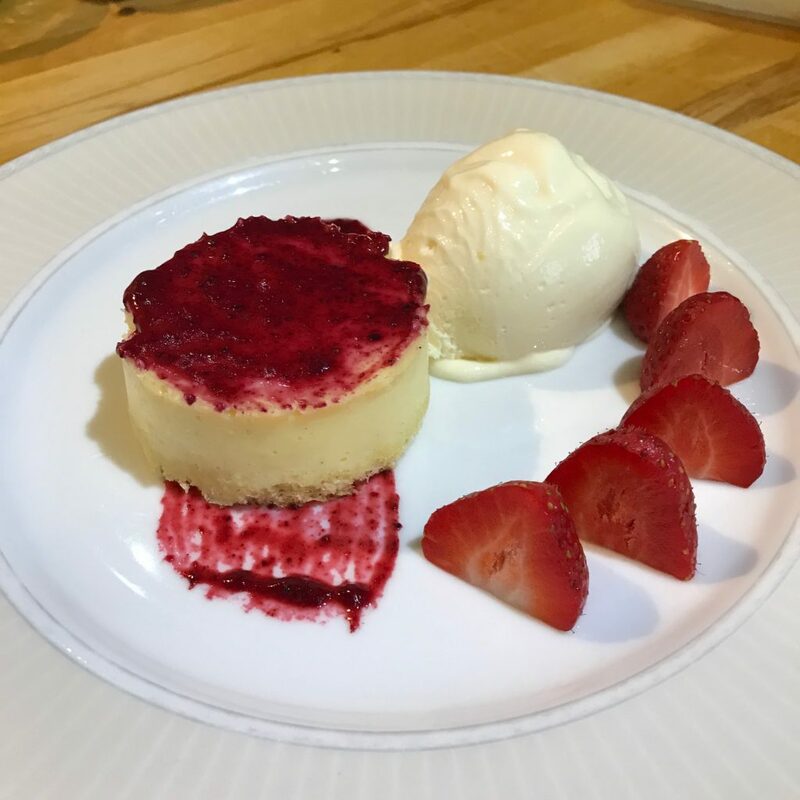 Served brushed with Berry Puree, Lemon Curd Ice Cream and really delicious Strawberries.